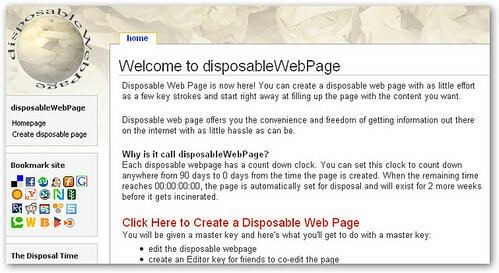 disposableWebPage takes your average wiki and adds a self-destructing twist to it. You can easily create web pages that have a handy countdown clock, ticking off the seconds until your web page is automatically sent to the trash bin. Each page can be set to auto-delete anywhere from 90 days to 0 days from the time of creation. All you need is a master key to edit the page, and you can invite your friends to edit it with you with Editor keys. So what use is a self-destructing web page? You can use it for planning future trips, jot down ideas for weekend plans, or just use it to countdown until some future event. Anything that has an inherent time limit can be used in conjunction with disposableWebPage. One thing to note is that pages will still be accessible for two weeks after the clock hits zero. Only after two weeks will they finally get deleted.